N = nblocks(M) returns the number of Control Design Blocks in the Generalized LTI model or Generalized matrix M.
AGeneralized LTI model (genss or genfrd model), a Generalized matrix (genmat), or an array of such models. The number of Control Design Blocks in M. If a block appears multiple times in M, N reflects the total number of occurrences. If M is a model array, N is an array with the same dimensions as M. Each entry of N is the number of Control Design Blocks in the corresponding entry of M.
This example shows how to use nblocks to examine two different ways of parameterizing a model of a second-order filter. where the damping ζ and the natural frequency ωn are tunable parameters. F is a genss model with two tunable Control Design Blocks, the realp blocks wn and zeta. The blocks wn and zeta have initial values of 3 and 0.8, respectively. Examine the number of tunable blocks in the model using nblocks. F has two tunable parameters, but the parameter wn appears five times—twice in the numerator and three times in the denominator. Rewrite F for fewer occurrences of wn. Examine the number of tunable blocks in the new filter model. In the new formulation, there are only three occurrences of the tunable parameter wn. 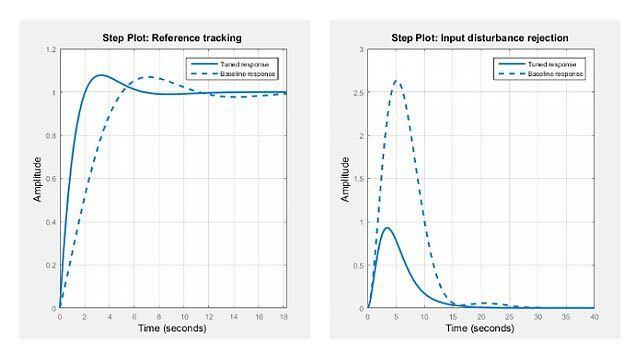 Reducing the number of occurrences of a block in a model can improve performance time of calculations involving the model. However, the number of occurrences does not affect the results of tuning the model or sampling the model for parameter studies.